Byblos Sud Village is an estimated $100 million project. It is the perfect setting for a uniquely privileged lifestyle and an opportunity to mix with the Elite in a luxurious environment on a historic and lively Mediterranean Port amid one of the trendiest and most prosperous seaside towns in Lebanon. Byblos Sud is 35 minutes drive from Beirut airport and only 15 minutes drive from Casino du Liban, offering the latest, most exquisite treatments, making relaxation and rejuvenation simply your lifestyle. 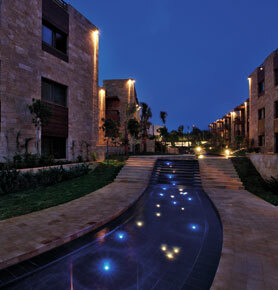 Byblos Sud offers 6 villas, 42 apartments and 10 studio apartments. All villas have a direct sea view and an 850 sqm space in addition to private terraces garden, private swimming pool and secure parking. The 42 apartments range from 130 to 290 sqm and enjoy a sea view, private terrace and secure parking. The 10 studio apartments ranging from 93 to 152 sqm, all with sea view, private terrace and secure parking. Residents will enjoy a superbly designed, flower and shrub gardens, grass lawns, pedestrian lanes, piazzas, water architecture and ponds. The sum of these features will stress the idyllic character of the village's public areas and enhance the quality of life of its residents. Owners of dwellings in this low rise, protected "village" stand to hugely benefit from this rare and exclusive setting.